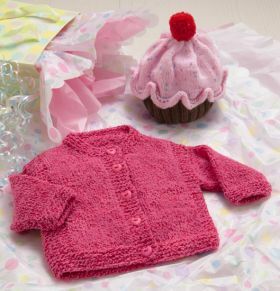 When you want to knit something special for a sweet little someone, popular author Doreen L. Marquart (aka Grammy) has the pattern. 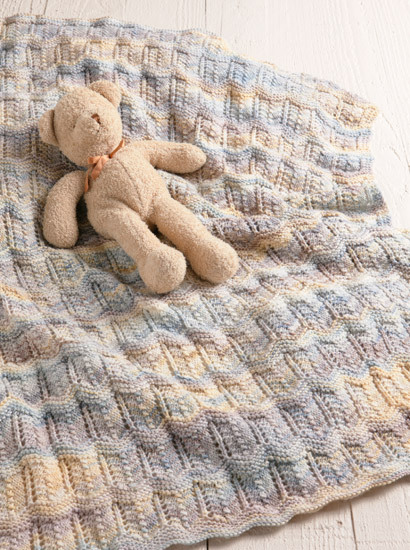 Featuring attractive, uncomplicated projects--in striking color combinations--this collection is brimming with baby-gift classics. 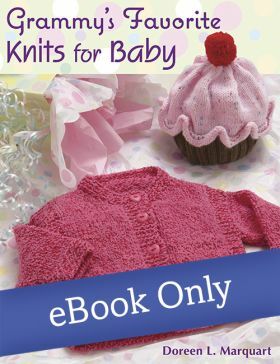 Grammy's Favorite Knits for Baby is written by Doreen L Marquart and published by Martingale & Company. 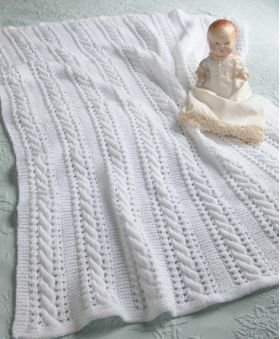 What fun it is to knit for babies. The projects knit up quickly, not much yarn is required and what we use is soft and cuddly. The book is comprised of Doreen's favorite designs. 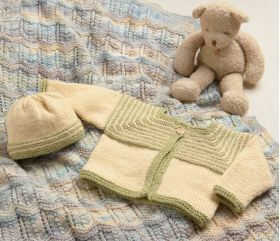 There are 20 projects from newborn to 24 months, ranging from easy to intermediate. 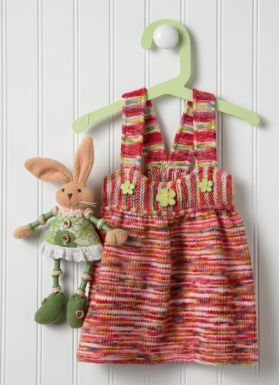 The designs are classic but what makes them new is the use of color striping yarns and color combinations. But what is not classic is the Cupcake cutie hat. 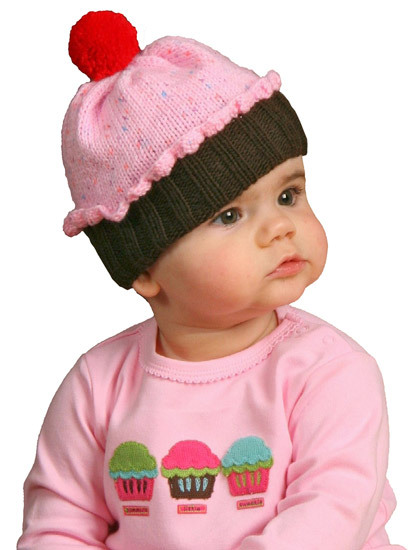 The Cupcake hat would make for an adorable first birthday gift. It is a chocolate cupcake with strawberry icing and a cherry on top. An adventurous Mom or Grandma could make a few of these as party hats and to be used as a goody-bag present for the little guests. 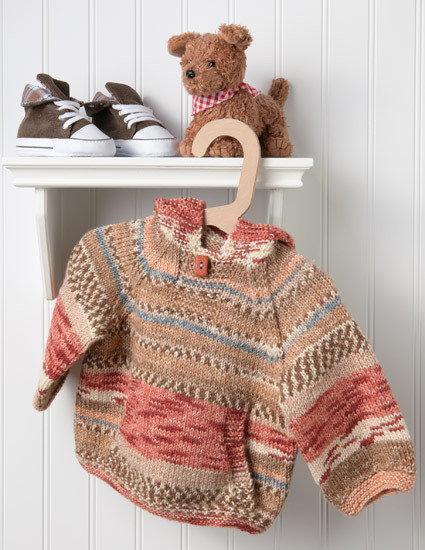 The projects range from sweaters, hats and booties, mittens, little girls' jumpers and more. Shoulder Button Pullover and Comfy Hoody are knit in the round. Knitting in the round for this age is almost finished before you start. The Comfy Hoody has a front pocket to keep all that stuff toddlers find so exciting. There are a variety of earflap hats to choose from. The Tricolor Ensemble has a welted hat that is beautiful. Once the hat is made you won't be able to stop until the booties, mittens and sweater are complete. Doreen gives tips and tricks given along the way. The knitting basic section also includes line drawings. 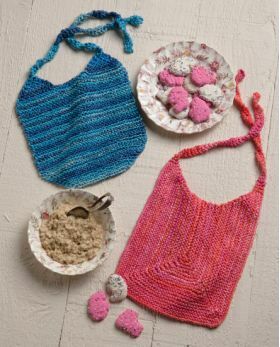 Have fun knitting these projects for that special little someone. This is a delightful book, one that will please any knitter who has an infant or toddler in their lives. The patterns are just precious and some are so beautiful they made me gasp. It starts off with a short introduction and goes right into the patterns. The end of the book has knitting basics and information about the author, Doreen L. Marquart. The book has fifteen patterns and I don't think that there is one that I wouldn't want to knit. The Chevrons and Lace Blanket is in soft grays and beiges, knit with sport-weight merino wool. The Comfy Cozy Cardigan is in a rose red and fits up to 24 months. It uses sock yarn and size 5 needles. The Party Time Jumper is adorable and is knit with a red variegated yarn and goes up to size 18 months. The Scalloped-Edge Jumper is in a chevron-style blue and is knit from the bottom up. It goes up to size 24 months. My favorite pattern in the book is the Comfy Hoodie, knit with superwash wool and sized up to 24 months. The yarn is self striping and is in a beige, rose, and blue colorway. The Quick-Knit Vest looks so mature for a tiny one that it is just too adorable. Again, it is sized up to 24 months and is in a variegated blue and red yarn. Usually, I'm not so gaga over small collections such as this, but these are all so tasteful and cute. I'm very happy I purchased this book.